• HELPS YOU – gives you the support you need to be able to re-order and render coherent the scalar life-force energy surrounding you – on your own. • Strengthens your body’s innate EMF defence systems so that you keep your protection intact. Over time this protection should improve even without the system in place. • Helps every cell of your body to find grounding, through sympathetic resonance. 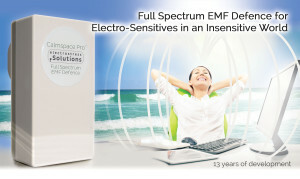 • Also removes high-frequency pollution known as “dirty electricity” from the mains and sends it to neutral, where it can be carried safely to the ground, removing an element of stress (high-frequency pollution has been found to lead to electrostress symptoms such as fatigue, hormone disruption, insomnia and headaches). 90-day money-back guarantee, so you can try it at home, and 5-year warranty.